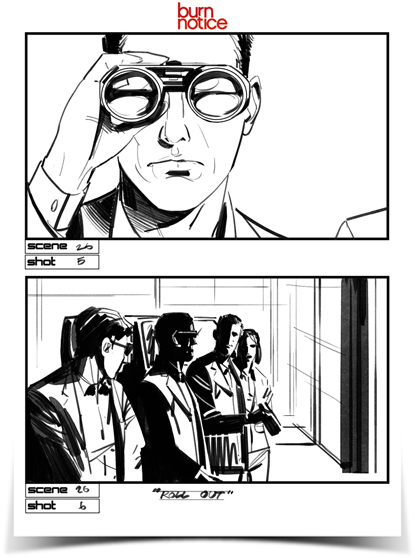 Here are some storyboards I was asked to do for season 5’s finale of Burn Notice. I was on a feature at Dreamworks at the time so I was able to offer a couple hours a night after work as well as weekends. 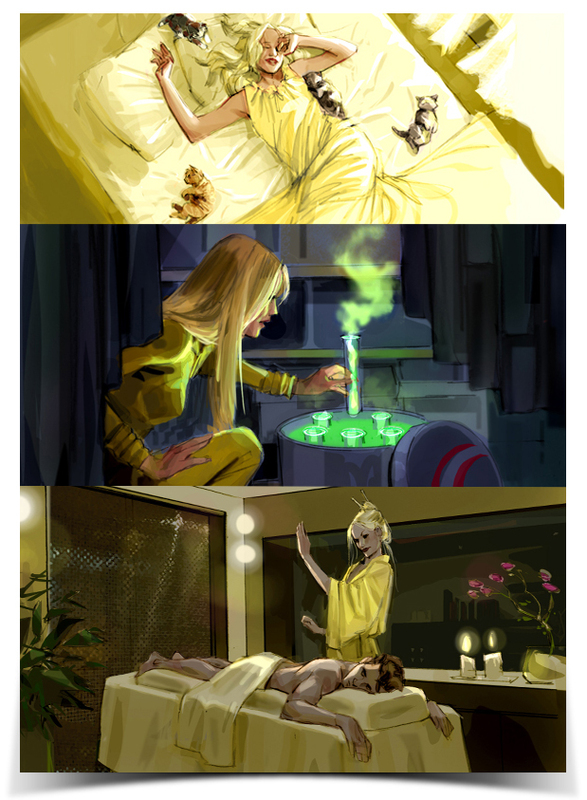 The workload was ridiculous and these were done directly with no preliminary sketches (clearly). “Previs” is a newer term used in the entertainment industry and is simply a short way of saying “Pre-Visualization”. In an industry which loves its little shortcut names this one is understandable. Previs is simply a way to visualize how a film could look before spending all the money to make shoot it. Pretty general term, yeah? Nope- not today. These days, previs refers to one type of pre-visualization: 3D animated versions of shots and sequences using, obviously, computer generated 3D models of characters, props and locations, all “shot” with virtual cameras within a computer. The effect of well done can often look quite amazing, but if the needed amount of work isn’t put in they can easily look rather corny as well. Either way, it is an excellent way of pre-visualizing a film. Previs is not easy to do. It requires a lot of time, talented 3D guys and therefor money. 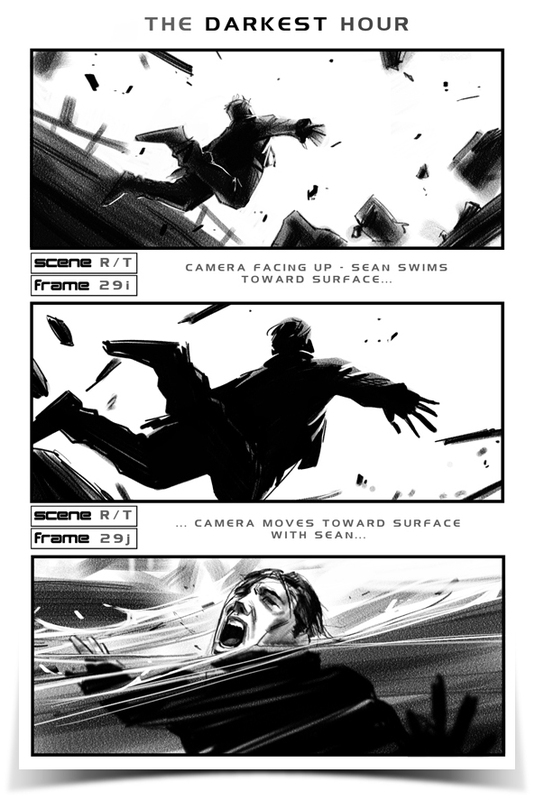 Previs teams will often employ storyboard artists to storyboard out the scenes they are going to build in 3D. I do have a point to make, something I want to point out. Storyboards ARE Previs. If you want to pre visualize a film, the quickest and most cost effective way to do this is not by employing a team of guys with computers, waiting for a month or two for a somewhat crudely animated scene. The most cost effective way to get it done is to hire an artist with a pencil! If you have the time and money, you should consider getting yourself a Previs team to render out your most important and hard to describe scenes and shots to get difficult shots figured out before getting out the fancy cameras, dressing your expensive sets and making up your talent. 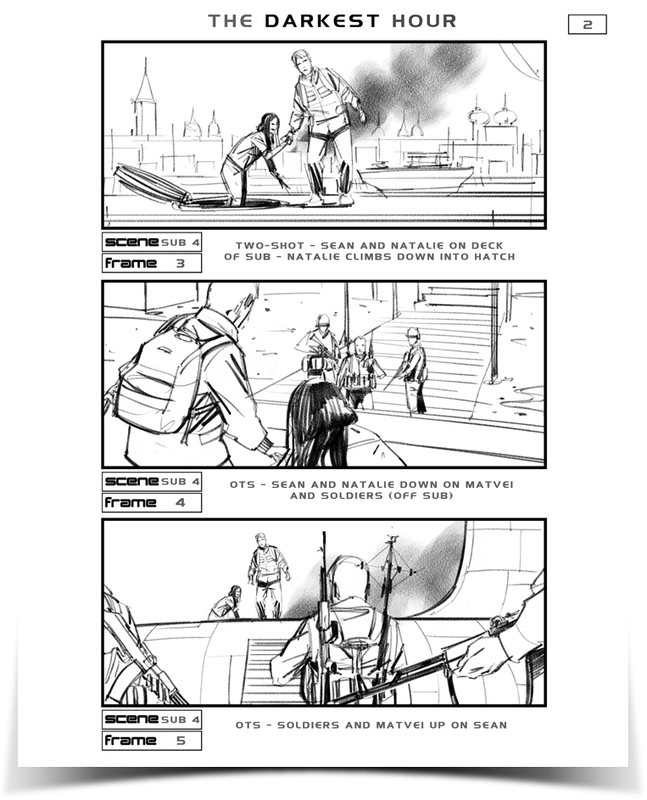 If you want a crisp, clear, relatively cheap and quick visual version of your film or key scenes- storyboard it! 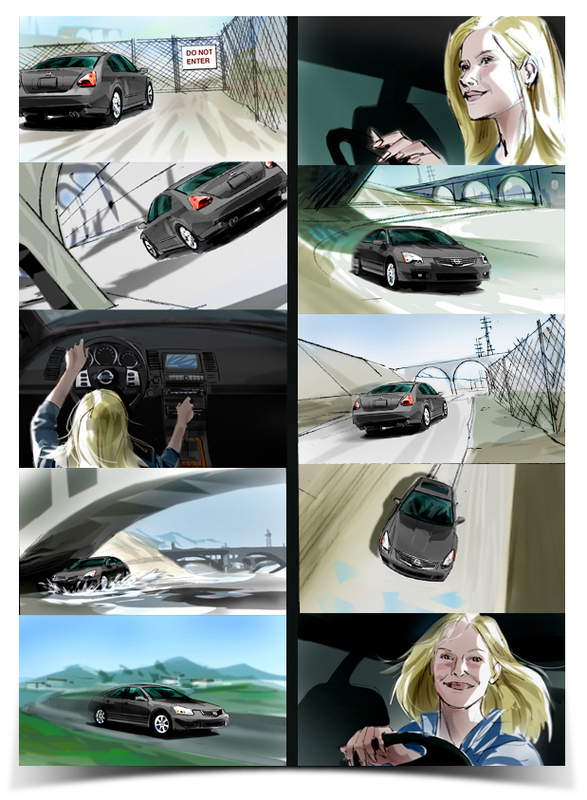 To see some of our storyboards click here. Originally used primarily in animation, the storyboard used to be called a story sketch. The first storyboard artists were called story sketch artists. The name story sketch artist should tell you all you need to know about what they did. They sketched out stories or told stories using sketches. The word “board” came about because these small, sequential sketches created by these story telling artists were often mounted on a large board or sometimes a wall so that they could be viewed in order and could do their job collectively in telling a story. 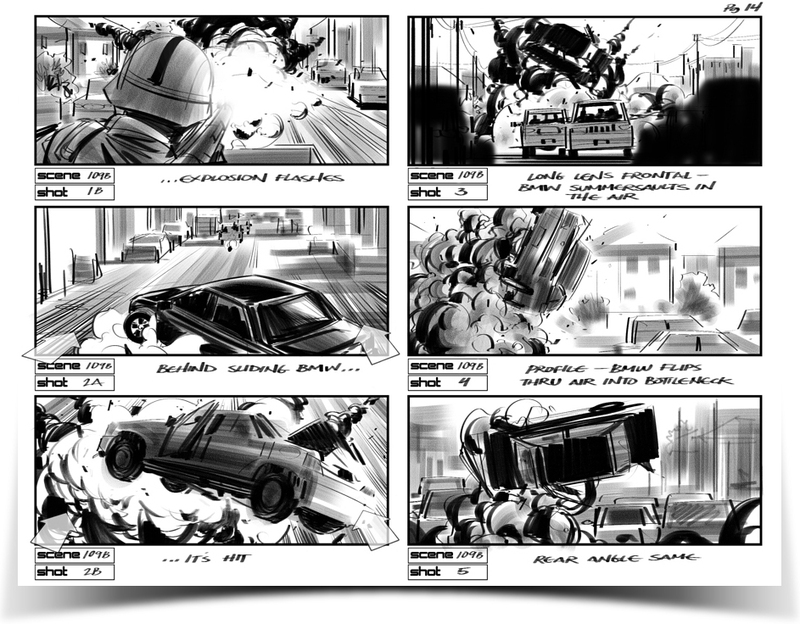 These “story boards” were viewed by others involved in the overall task of creating the final product, be it an animated or live action film. They helped the entire crew get in sync with one another and work together toward that final vision. Imagine you were preparing to film your own movie and were working with many different talented and creative people to make it all happen. You have a lot of money invested and need to get it right. You have an action scene to film which involves a “red sports car”. Everyone in your crew who reads that in the script are going to imagine something different, even though they will all imagine what would be correctly described as a red sports car. Some will see Mustangs, others Ferraris. The car is described as “flipping violently” as its final, dramatic scene comes to a crashing end. Some guys will imagine it tumbling end over end, others will picture it rolling over its sides. Some might even see it hurling through the air like a frisbee. And, per the script- none of them are wrong! This is where the Director of the film comes in. Primarily, his job is to be the the guy with the most ideal envisioning of the story. It’s his (or hers) imagined version of the story which is going to be translated to film. How does he insure that the rest of his crew works toward his vision? Do the producers just gamble on the idea that his verbal explanation will be enough? He does use good hand gestures when he talks… no. Imagine the stunt with the red sports car. The stunt coordinator goes ahead and rigs the car for the flipping shot and while it is technically still right, it’s not at all what the director envisioned- so, basically it’s wrong. Do you just settle for such mistakes when Hollywood money is at stake? Just bring out another Ferrari and load a new roll of film? Re-rig everything and burn another tens of thousands of dollars? Or, do you come up with a more simple and far more cost effective solution- storyboard out the scene long before you shoot. Directors use storyboards regularly these days, not just in animation, but for live action film, television, music videos and television advertising. Storyboards aren’t just used for production purposes as described above, they are also used as a relatively inexpensive means of showing a client, say someone with a product they want you to shoot a commercial for, what the final commercial will look like. When dealing with the amounts of money it costs to make these things, when writing checks with such big numbers, it’s good to have a clear idea of what you’re getting. As a film maker, you’re dealing with a visual media- simply telling your client what you’re planning to do isn’t going to be enough. If you want to sell him, you have to show him. 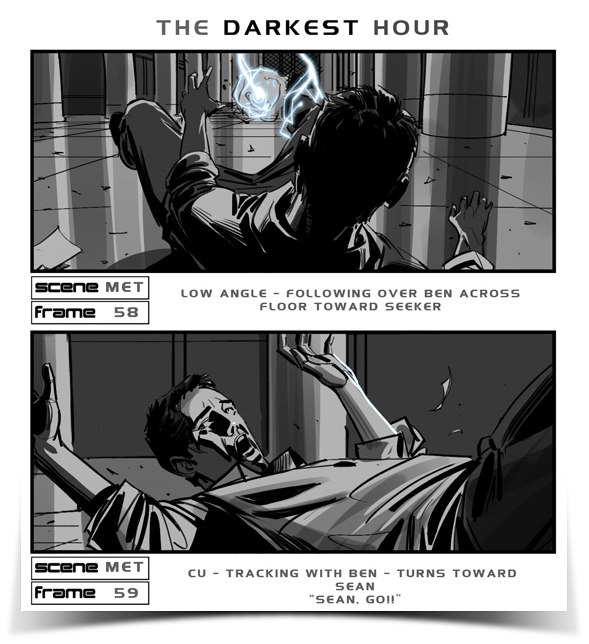 Storyboards are usually drawn by talented artists. Some people try to cut corners and save even more money by using snapshots but these tend to look amateur and can limit what you can show. You’re locked into what you can photograph and don’t have the flexibility that and artist with a pencil will provide. While storyboards are a form of illustration, they don’t always need to look beautiful. An illustrator working on a single illustration needs that one piece to hold its own and blow some minds. In storyboarding it’s a little different. Each image itself is less meaningful and ideally isn’t meant to stand on it’s own. 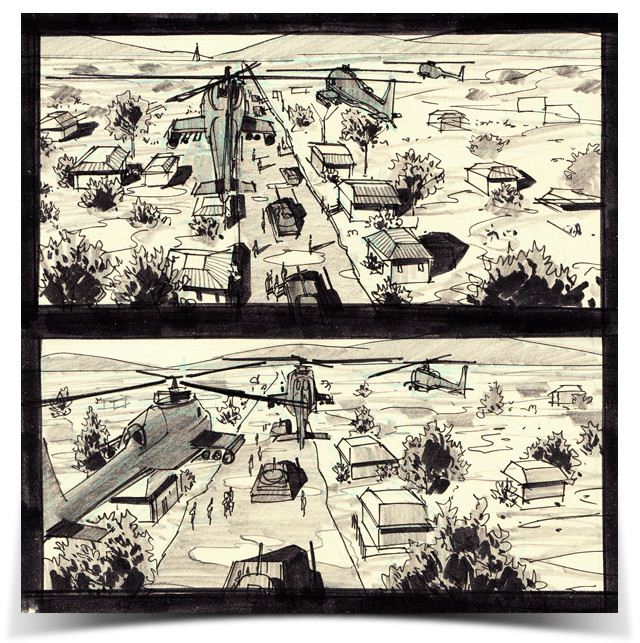 Collectively, a well thought out sequence of images, viewed together in correct order which tell a story- this grouping of smaller works is the storyboard artist’s illustration. Each small illustration or “panel” (more of an older animation term) or “frame” (more modern term used in film) is like a brick. On its own it isn’t so fantastic, just a brick. Grouped together with care and creativity and you end up with a cathedral or a Great Wall of China. A well thought out sequence is more important than each frame being drawn incredibly beautifully. Often times the client will just need a raw, basic and rather crude layout of a sequence sketched up. 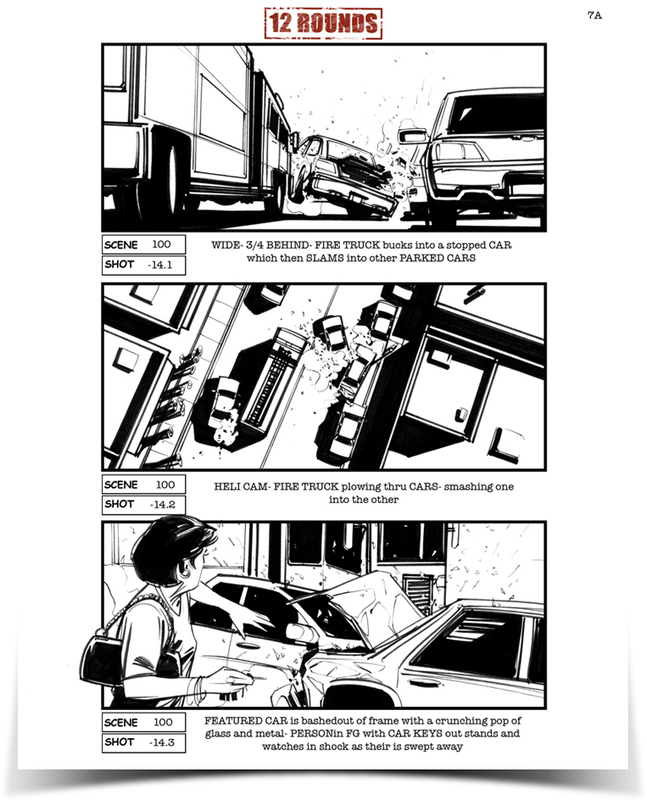 Everyone knows at this point that the red car is going to be a Ferrari so in your super sketchy storyboard frames it just might just need to be clear that it’s a car, period. Other times though, it may be very important to have that car look amazing. Maybe the boards are intended to dazzle the investors, romance the studio heads and help produce more excitement and therefor money for the budget. This can be the case. 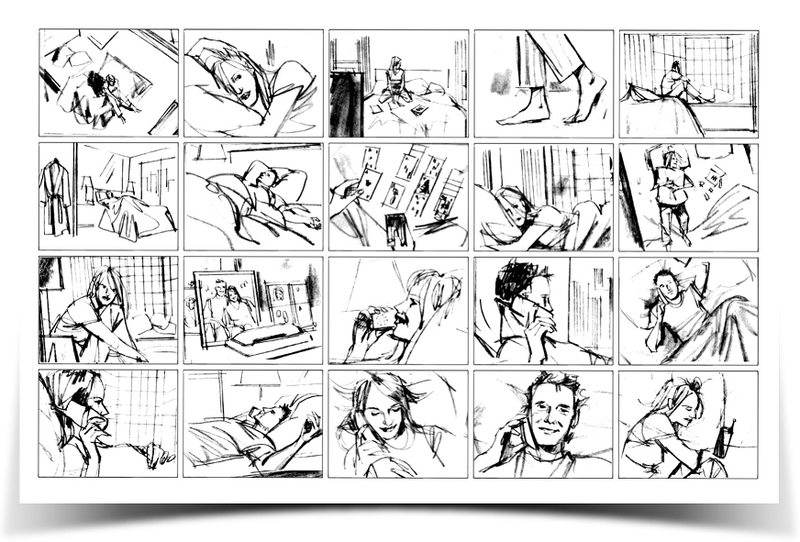 The ideal storyboard is one which tells a story clearly and which also conveys a sense of the aesthetic which the final, filmed product intends to have. 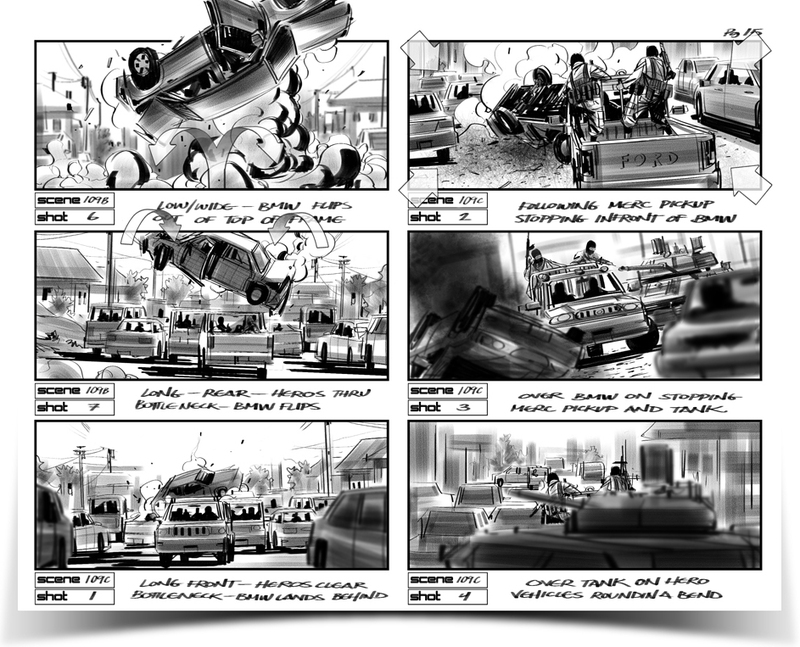 The storyboard is often the first visualization of a finished film or video. It can be described as being similar to a comic book or comic strip but unlike those, it is not the end product but rather, it is an envisioning of the final product- a roadmap to it. Doodles co is a very small and tight group of storyboard artists and illustrators who work out of the Los Angeles area but whom also tend to travel for work. We have been working in the film and advertising industries for many years. You can view our résumés and samples of our storyboard and illustration work here.